In late April, a couple of Sun columnists went to Camden Yards to cover an Orioles game. By the ninth inning, they'd both been laid off. Even by the sad standard set by newspapers across the country, The Baltimore Sun has had a rough go. After the latest round of cuts, a newsroom that had more than 420 employees a decade ago now has just 140. At the beginning of the Bush administration, The Sun had 11 staffers in Washington. It has one today. Having previously shuttered bureaus in London, Beijing, and Moscow, the paper in the last few months closed local bureaus, including the one in Annapolis – Maryland's state capital. In late April, a couple of Sun columnists went to Camden Yards to cover an Orioles game. By the ninth inning, they'd both been laid off. But some of the paper's high-profile readers – and former employees – say that smaller is just smaller, and that a metropolitan daily once committed to investigating crime and corruption across the city and state now seems to be dying a fast death. "When I read the Baltimore Sun," says Sen Ben Cardin (D-Md. ), "it's somewhat painful." Cardin said that the cutbacks and shuttering of news bureaus has had a significant effect on the breadth of coverage for which the Sun was once known. "It is disturbing to me," he said, adding that Sun readers – his constituents – are now "missing something" each morning. 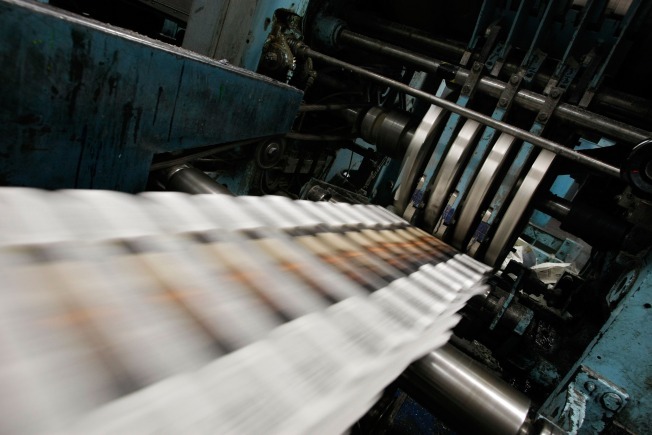 Recently, Cardin jumped to the forefront of the national death-of-newspapers debate by introducing the Newspaper Revitalization Act, a bill that would allow some newspapers to operate as non-profits. And last week, Cardin testified before a Senate subcommittee hearing on "The Future of Journalism," alongside former Baltimore Sun reporter-turned-television producer David Simon. Simon, who left The Sun in 1995, dramatized the paper's travails on "The Wire," the critically acclaimed HBO series. He said he's seen a steady decline in The Sun's coverage of Baltimore and central Maryland since the mid-1990s under the stewardship of two corporate owners: Times-Mirror and later The Tribune Company. But the recent layoffs of 61 staffers, he said, "are the last nails in the coffin." At times, Simon said the paper can relive its former glory through serious investigative and beat reporting. But generally, he said the paper isn't covering the region and issues with "complexity, care and consistency." Most days, when it comes to assuming the government watchdog role, he said, the Sun "is no longer even pretending." Understandably, the Sun's editor sees things differently. In an interview, Cook said the Sun is preserving its "core values" amid the cutbacks — and that those values include a commitment to investigative and beat reporting as well as the "watchdog function." The Sun's breadth of state and local coverage hasn't changed since the late April cuts, Cook maintained, pointing to front-page reporting on the financial struggles of the Preakness Stakes, state tax issues and the indictment of Mayor Sheila Dixon. Cook talks up reinvention of the Sun as a "platform-neutral" operation that no longer puts print above all else. The Sun, he said, has to own "quick-hit information" shot to mobile devices and laptops, while not forsaking the shoe-leather reporting on government and civic institutions. Cook said the Sun will be generating just as much content as before because the most recent layoffs barely touched the reporting ranks. However, that's caused concerns over whether the Sun's standards will be maintained now that the editing staff has been thinned out, and content will move more quickly to the web. And Cook's public statements haven't always assuaged staff fears that quality is no longer Job 1; at an appearance at Johns Hopkins recently, Cook declared that "the days of the six-part series are gone." While bloggers and citizen journalists might pick up the slack in some areas, it's unlikely they'll take on lengthy investigations that papers like the Sun once did. In 2006, Sun reporters Fred Schulte and June Arney spent months reporting a four-part series on "ground rents, a colonial law that allowed ownership of the ground under a house -- and a peculiar loophole that let such owners begin seizing properties during the real estate boom. The series involved extensive reporting and database maintenance that no reporter churning out daily (or hourly) content would able to do. "That was the kind of thing that only the Baltimore Sun could have done," said Schulte, who took a buyout last fall. But it's unclear if they still could do it: The four-person investigative team at the Sun when Schulte started in 2004 is now down to one reporter. The "ground rents" series was a finalist for a Pulitzer, got a nod on "The Wire" and -- most important - prompted the government to take action. Martin O'Malley, in his first act as governor, signed a bill reforming the centuries-old law. "Certainly, newspapers have played an important role in shining a spotlight on issues of injustice or inequity," an O'Malley spokesperson told POLITICO, "and to the extent that the future of this important industry is threatened, the governor believes strongly that the integrity of democracy itself is also at risk." Cardin also talked about the effects on democracy, suggesting that the Sun will have trouble keeping Maryland residents informed about their representatives in Congress without more reporters based in Washington. Tim Franklin, the Sun's previous editor, said that "Washington coverage is vital to the Baltimore Sun." Franklin, who now runs the sports journalism program at Indiana University, can speak more freely about the Sun's owners now than he could back when he was the one being asked to make the cuts. Although Franklin said he understands the economic arguments for cutting Sun staff in the capital and consolidating Tribune bureaus – a move that came just weeks before he shipped off to the Hoosier State – he believes there are stories missing for Baltimore readers. Reporters from The Tribune Company will now provide the lion's share of the Sun's Washington coverage. But given the state's large defense and health-care industries, Franklin said dispatches from the Pentagon or NIH should be written with a Baltimore Sun reader in mind, rather than in a way that's suitable for Tribune papers in Connecticut or Florida. Closer to home, the Sun's former editor is concerned about the paper being stretched too thin in covering Maryland. "I think you get the best stories when you're in the communities, walking the beats, observing changes in the communities," Franklin said. "Those are where the best stories emanate. You can cover those areas from downtown [Baltimore], but I think the possibility of missing something goes up when you're not there." Cook maintains that the paper is still well positioned to cover state and local government while also keeping an eye on the nation's capital about 40 miles away. Simply leasing buildings in the counties, he said, "does not equate commitment to coverage."